The decision to sell the E30 has arrived suddenly. Whether it was the suited-up customer sweating his balls off on the short drive to lunch, delayed trauma from last winter's terrible car fiasco, or three trips across state lines in the past three weeks with power steering screaming like a child, the time has come. The time being to experiment with a concept that has never been attempted in my garage - to separate project cars from street cars or at least have the option to do so. The current thesis is that having a daily driver that is constantly teetering on the edge of transport and complete destruction makes a man spend a ludicrous amount of time just keeping the damn thing in good enough shape to get to work, thereby giving him less time to build that Vauxhall Victor gasser that appeared in post Bulleit and Nyquil cold treatment dreams. After predicting the trajectory of the car as going into future project status, the decision was made to put a feeler out on the market before something nonsensical and irreversible was done to make the E30 undrivable in normal conditions. 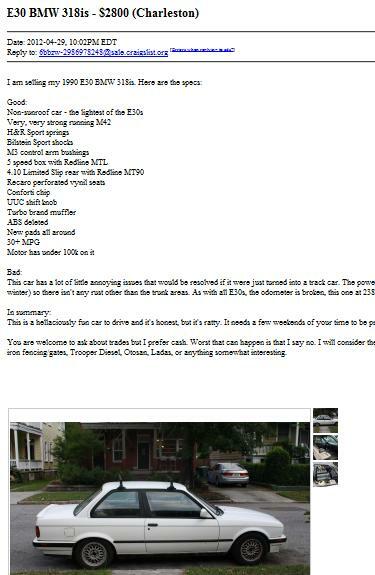 Therefore, track day car, short term project, and generally reliable transportation is now for sale or trade on craigslist and will most likely be traded for custom wrought iron fencing. Yeah, I'm dead damn serious. Like when your parents got you a puppy right before your beloved childhood dog took a dirt nap, I added something else to the curbside before offloading the BMW. What did I get? 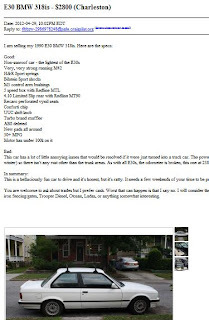 Why, the AMC Eagle of the new millenium, of course; a 2005 Subaru Impreza 2.5RS. But why did I get it? Really, it was a crime of opportunity with a friend offering the car up to me for a good deal and me being a tightass, I couldn't refuse. More on the adventures with the Subaru later but for now, I'm just enjoying A/C and working radio presets.